Why volunteer overseas in Peru? What about visa requirements for entering Peru? There is a need for passionate and motivated volunteers in countries all over the world. Not only do overseas volunteers have the chance to interact with other culture's and people, and exchange and share ideas, but also get to contribute something meaningful to the world. Each pair of hands is creating a positive change one step at a time. With Karma Yoga and the path of selfless service, extending compassion and removing the borders that divide self from others is a life-changing experience for everyone involved. Giving of oneself is a path toward greater social engagement and leads to more connected and enriched global communities. Walk among one of the best examples of ancient Inca terraces, created in the form of a llama, up to the Temple of the Sun built exactly where the rising sun's rays fall on the solstices. From here, there is a clear view of a gigantic face, called 'Wirraccochan'', carved into the opposite mountainside and a magnificent view of the surrounding Sacred Valley. We will then visit the still very traditional village of Ollantaytambo including a visit to the fascinating house of a villager. Following a beautiful ride through many small, traditional community towns along the main Sacred valley road, we'll visit the mountain-top ruins and ceremonial centre of Pisac, hiking among the Inca look-out towers and the Temple of the Sun. We descend though agricultural terraces carved into the mountainside in the shape of a condor directly into the town and lively market of Pisac. Explore the town or go shopping in one of the best markets in the area for artisan goods. Walk among the massive zig-zag structure of the ruins of Sacsayhuayman and to the astronomical tower beyond which is a stunning panorama over the mountains and city of Cusco. Then we can explore the tunnels and caves of the mysterious ruin of Qenko and walk up to the Temple of the Moon. Further along the road into the valley is the Inca fort of Puca Pucara, surrounded by local people and llamas. Finally at the ruins of Tambo Machay you can see a working Inca water system. Cusco, meaning in Quechua navel of the world, is a hive of Andean culture and buzzing nightlife centered around the beautiful Inca and colonial style Plaza de Armas. You can choose to visit its unique cathedral and many churches, its various museums, explore the artistic barrio of San Blas or just take advantage of Cusco's great markets and shops. We''ll ride through the maize fields and villages of the valley of Chicon and then hike towards its snow-capped glacier lying right behind Urubamba. Crossing streams and exploring trails, we arrive at a meadow where cattle graze and wild horses roam where well rest and have lunch at the base of a towering waterfall. Here you can explore the forest of Peruvian ash trees and climb up the rivulets and rocks right to the waterfall for a closer look. See the sunken, concentric Inca terraces of Moray. Then we hike through the patchwork fields of the valley to arrive at the Salineras of Maras. Step right through the narrow walkways between the multicolored salt pans layered into the mountainside. Dating from pre-Inca times they are still in use today. 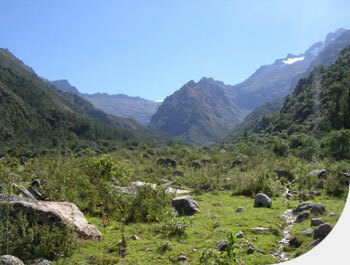 We then hike towards Pichingoto crossing and walking along the Urubamba River. There we will see the cliff dwelling houses of Pichingoto and take a tour with a local of one of the houses built into the cliff face. Please verify that your passport is not only current but will not expire for at least six months after your program is scheduled to end. If you do not currently have a passport, please consult with the appropriate agency to obtain your government''''''''''''''''''''''''''''''''s requirements for obtaining one. Processing time needed to obtain a passport varies but can take up to two months to receive. The climate in Cusco and the Sacred Valley, Peru is generally mild. Days are warm and sunny with an average high temperature of 66°F (19°C). Nights are cooler with an average low of 37°F (3°C) with temperatures generally 5° warmer in the Sacred Valley. The rainy season runs from November to March and the dry season runs from April to October. During the rainy season afternoon showers are common, but there is rarely rain during the dry season. The best times to visit are May and June since they are the mildest months. The program is available for individuals over 18 (unless accompanied by a parent or guardian) from any country with an adventurous spirit and a true desire to help others. In terms of yoga, practitioners of all levels are welcome. The asana class will be taught as a mixed level class. The actual karma yoga can usually be adapted to participant's abilities, skills and strengths. We encourage each and every one to share their interests and skills so bring along any musical instrument, games or tools needed to express and share your passion. We strongly suggest you have a genuine will to help and a liking toward children. Please Go to the register tab, and fill out the form. Choose your preferred options for accomadations. Please put in your information in the fields given. You can send a check after filling out the form or simply make your deposit via credit card. A $500 deposit saves your spot. When the rest is due, by 30 days before the journey departs, please send a check for the balance. Arrange your airline tickets for Cusco to arrive on May 17. Return on the 31st or if you choose the optional trip to Macchu Pichu, choose June 2 as your return date. We strongly suggest flight cancellation insurance. Please contact journeys@yoga.com to answer your questions about the journey.